since year 2000, the serpentine gallery in london’s kensington gardens invites world’s major architects to design summer pavilions. temporary structures, alike extremely evocative contemporary architectures, are arisen next to the gallery for a three-month period. built in 1934 as a tea pavilion, in 1970 the serpentine gallery became a window for modern and contemporary artists’ exhibitions. 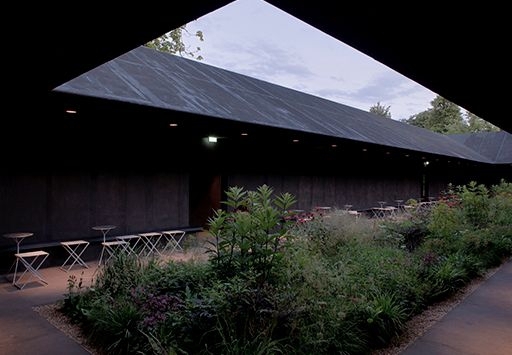 in the program conceived and created in 2000 by the serpentine director ms julia payton-jones, the pavilions are designed by international architects or groups of designers that, on the day of the invitation, haven’t yet 'created' in england. it is a unique invitation program; an event that draws the interest of 250000 visitors each summer. not more than 6 months must pass between the invitation and the completion of the work. six months of intense designing that have now seen the participation of Viabizzuno. 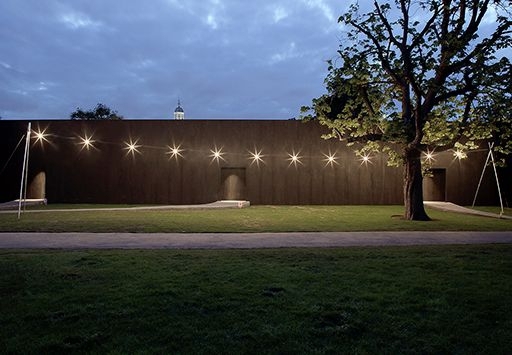 master peter zumthor has signed the 2011 serpentine gallery pavilion wanting mario nanni to work by his side designing the correct light for his first english work: 'hortus conclusus'. a garden in the garden, a contemplative space where light redesigns architecture transforming it into a sensorial and emotive experience. outside: a wall with only one breach; inside: a space with a large opening towards the sky. a spiritual and emotional bubble, a space for sitting in meditation, a place for observing nature without rush. keen to his poetical design, peter zumthor has principally dedicated his attention to materials. natural, simple, evocative… materials are essential in the pavilion’s architectural project. 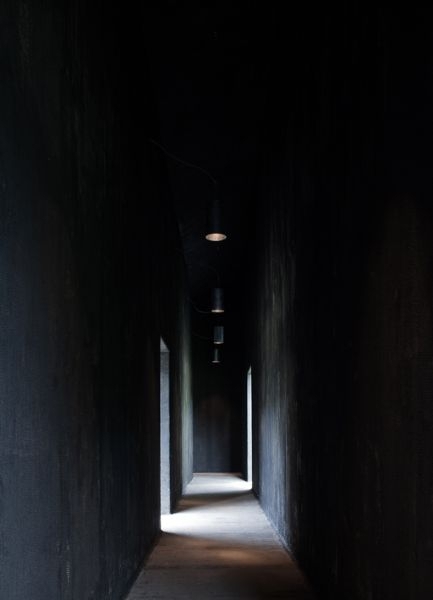 a structure made of wood covered by a raw canvas absorbs light: a pathway in semidarkness – narrow, silent, contemplative – guides the visitors to the internal court, from black to colour. the garden, designed by german designer piet oudolf, is a nature keeper where the silent horizon of the eyes is free from any element, especially unpolluted by artificial light. according to zumthor’s architecture’s values, raw materials have been used to emphasize the contemplative function of the structure. wood, natural iron, zinc and jute play a starring role in a spiritual environment that leads to meditation. it is the return to nature and simplicity, essential for regaining time and memory. great awareness has been paid towards matter and perceptive study of the elements, more than towards design. therefore luminaires have been designed developing this concept. light is functional to the path, and is integrated into the arcane shapes of the 'hortus conclusus', not to outline it, yet to highlight it. the three special Viabizzuno luminaires, designed by zumthor himself, have been conceived thanks to a thorough analysis of light and its relationship with matter. master zumthor requested light to be functional, not decorative, nor esthetical or fancy. contemplation must be stimulated by a non-invasive elementary light. the first meeting between peter zumthor and mario nanni to talk about this project started with the swiss master holding in his hands a piece of watering can. ‘I want light, not design’ he stated. nothing decorative, only substance and matter. the matter of the zinc as material in contact with the ground, the garden, the domestic making of the growing. the search for essentiality, simple and primordial gestures of taking care of a space for himself. and with that piece of watering can mario went back home to create a light. clean, essential, rigorous, absolutely in accordance with the black box designed by master zumthor: a light wooden frame coated with a dark waterproof canvas with which to get protected from the weather elements. the dark, stiff volume stands on the grass, passively, discretely. thanks to the light of suspended cylinders, its shady paths inside lead to a quiet central garden, creating an introspective space where to reflect about the natural architecture of the plant world and to absorb the silence of the growing flowers, of the shining sun, of the passage of the clouds. with the nice weather the black box shows a strong contrast with the bright green and the blue of the sky. in the darker days this experience makes the darkest corners of the mind come closer to what would have been the blossoming of flowers in the dark. 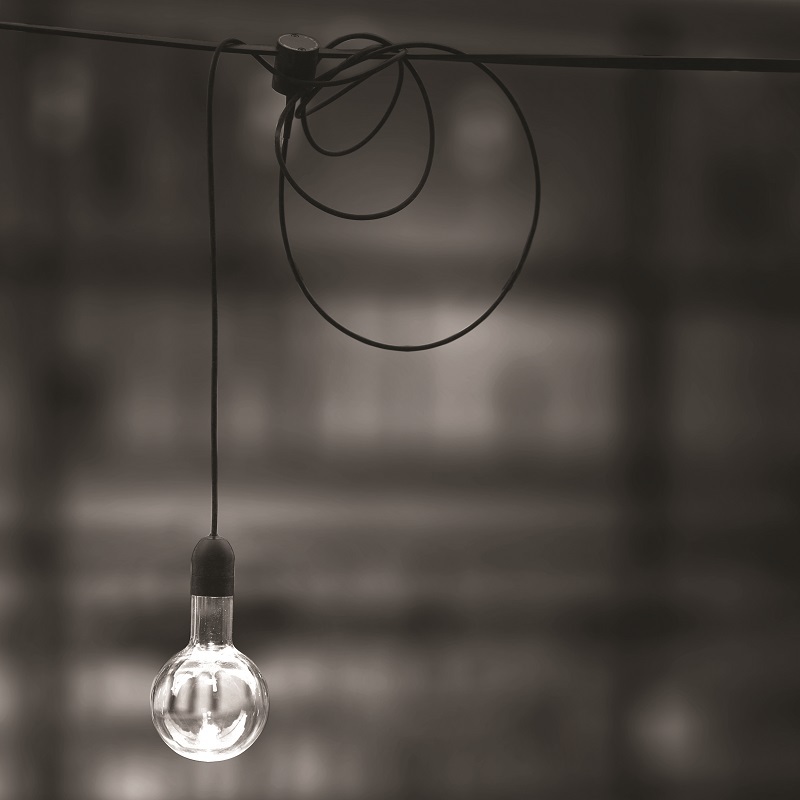 the relationship between natural and artificial light becomes fundamental. the light made by the man does not have to be an act, a performance, a self-celebration; it just has to be light for the light. 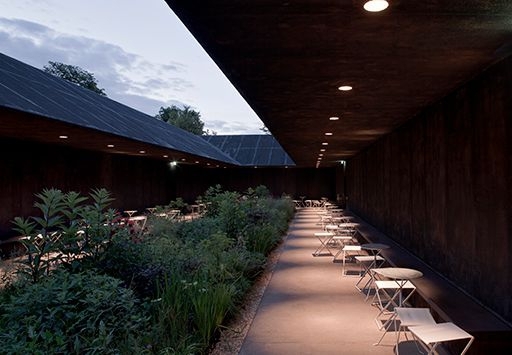 zumthor wanted to go back to the magical effect of the incandescent light. the entrance was designed with a galvanized iron catenary with E27 light bulbs, a kind of festoon like the ones of the village festivals. a simple light that attracts, familiar, not spectacular. 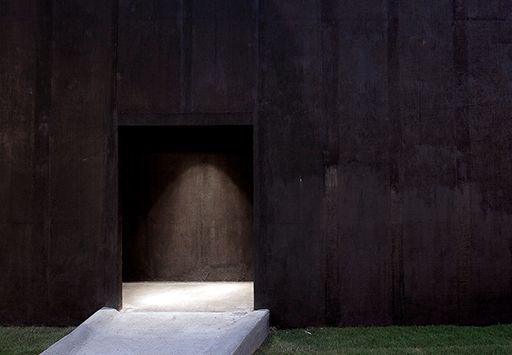 the entrance of the building is evoked by an opening. a backlighted threshold signs the breach of the path that surrounds the yard. a blind lane is revealed by the rhythm of shadow and light created by the constant motion of 26 cilindri a sospensione, hanging cylinders zinc-plated on the outside and coated inside with a special black varnish (my nero Viabizzuno) that boosts the specifically studied optic effect to have light only where required. the path guides to the central garden which is the emotive hub of the entire project: a place of flowers and perfumes, flood exclusively by natural light. yet the passages and the seats on the garden’s perimeter are highlighted by artificial light generated by 34 built-in luminaires. light barely touches the perimeter of the garden and falls perfectly on the zinc-plated seats and tables. on the outside, the façade is adorned with a catenaria di luce, a 'chain' of old incandescent light bulbs hung to galvanized iron E27 sockets. furthermore emergency luminaires are a special edition of the trasparenze Viabizzuno which, for the occasion, have been framed by thin galvanized iron. in fact master zumthor also found too much ‘designed’ his trasparenze he designed for Viabizzuno years before. light and matter live together and emphasize each other in this space which each year is created as a temporary structure, yet is an indelible trace in the international designing world. at the opening the first master’s words were: 'enjoy my architecture'.